According to publicly available records and genealogy databases, Isabel Gladwin Newton was born on July 21, 1891, in Geneva, New York, to Mary Risley Gladwin, age 24, and Frank Ellsworth Newton, age 28. Isabel Gladwin Newton met George Barton when she was twenty five years old and working as a bookeeper in a preserving and canning plant. She responded to his contact and offer for work; she reported being particularly motivated by the salary of $15 per week, which was more than her $11 weekly salary at the plant. She began working for him on August 1, 1916. (Barton, 1968). She reported being "drawn to him from the very first" and immediately began acting as his secretary and helping him with the publication of several articles and books. 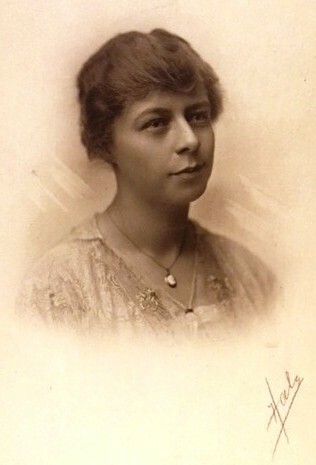 She also provided significant material support to Barton in helping to manage his correspondence and organize materials for the First Consolation House Conference and founding of the National Society for the Promotion of Occupational Therapy in March 1917. To go back to the calling of the conference at Consolation House prior to the formation of the National Society, Mr. Barton had contacted four leaders in their various fields, and so it was that these five zealous workers in the subject, with a very young, most inexperienced though intensely interested sixth, the young secretary, came together at Consolation House in March 1917. She served aptly as the first secretary of the National Society of the Promotion of Occupational Therapy. Review of the correspondence between Barton and Dunton at the time indicates that Isabel Newton was able to effectively coordinate the development of mailing and membership lists, dues collection, and many other tasks that were critical for the new profession. In fact, following her resignation, it is clear that the record keeping associated with the group was a significant challenge for her successors. All of this evidence indicates that Isabel Gladwin Barton, although young and inexperienced and certainly not a luminary in any field such as nursing or medicine or social work or teaching or architecture, was still a critical point of support for George Barton. George had ongoing challenges with disability and there is no doubt that his wife Isabel helped him to achieve the goals that he set out for himself. Every dutiful occupational therapy student is led through the profession's "catechism" of history; typically memorizing the names of the OT founders pictured in the famous photo shown here. Of course, serious students know that some of the key players responsible for occupational therapy's emergence are not even pictured; and one who was pictured (Isabel Newton, secretary and paramour to Mr. Barton) was largely incidental. I believe that use of the term 'paramour' trivializes the important work that Isabel did for the National Society for the Promotion of Occupational Therapy in general and for George Barton in particular. Following her husband's death she withdrew from active participation in occupational therapy, focusing on raising their young child. She regularly followed the developments in the occupational therapy field and as noted above was called upon to present the history of the occupational therapy founding at several important events (30th anniversary, 50th anniversary). Isabel was not just a secretary, as her husband George noted in his book dedication. She was a dedicated parent, an accomplished seamstress, a faithful correspondent, and she loved her parents and other family members. She was also fiercely independent and took care of Consolation House on her own for many years. At the end of a long day after her son was asleep she would read books deep into the night and she would also indulge in going to the movies, which she loved. She also remained deeply in love with George, and celebrated their wedding anniversaries long after his death. These details were all made available to me as I have had the privilege of reading five years of her personal diaries. Isabel Gladwin Barton was recently named to the AOTA 'Influential Persons List.' Her support for George Barton and the skill that she brought to her role as Secretary of NSPOT was certainly not incidental. Her appearance on this list is an honor that is deserved. Barton, G.E. (1919). Teaching the sick: A manual of occupational therapy and re-education. Philadelphia: WB Saunders, Co.
Barton, I.G. (1968). Consolation House, Fifty Years Ago. American Journal of Occupational Therapy, 22(4), 340-345. Newton, I. (1917). Consolation House. The Trained Nurse and Hospital Review, 59, 321-326. OMG! They called this nice old lady a 'paramour'! So rude.